We are mid-way through our summer of sport, with last week marking the most successful Olympics for Team GB since 1908. Whilst Rio used its existing national soccer stadium for the opening and closing ceremonies, it also built a number of other stadiums and venues for the games. New stadiums and sporting structures are expensive to build and operate. In order to be profitable they need to become go to destinations, 365 days a year – not just on sports or match days. What role can technology play in achieving increased revenues and this year round objective? Information technology and audio-visual systems (IT and AV) are critical to delivering and engaging supporter experience. Advances in mobile technology enable stadiums and other sporting venues to create and sustain a deeper and more profitable relationship with their fan base. Smart phone ownership provides the opportunity to develop this relationship but also drives the demand for good content. The funding model: is the stadium project actually a mixed use scheme incorporating features such as a hotel, residential, office(s), cinema and conference centre? Multi–event: can the space be used for concerts, exhibitions or ground share? Can technology underpin the funding model: for example, what facilities make an excellent conference centre? Growing the fan base: use technology to project the emotion of match day to fans across the World. Make the stadium the ‘home’ and key part of the history of the club – make it a destination to visit. From match day to stadium day: how can the time fans spend in the stadium be increased before and after the match or event? Examples include using Wi-Fi to provide access to exclusive pre-match content and making use of outside space for post-match events. Point of sale mobility: use stadium wide high density Wi-Fi, combined with PoS. 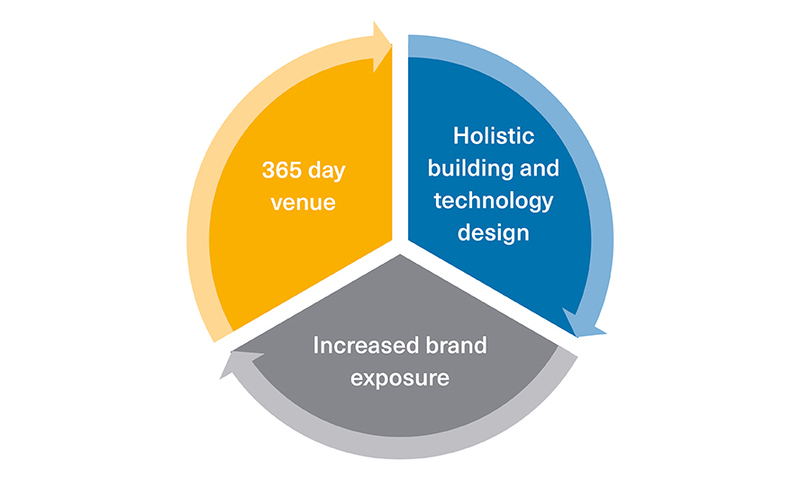 Click here to read Stadium & Sporting Venues – Go Digital White Paper, which outlines how digital (IT and AV) technology contributes to the fan experience, gives examples of our recent work, and our approach to delivering solutions for stadiums and other sporting venues.